Revolution Bar | Pub Quizzers | Find a pub quiz near you, now. 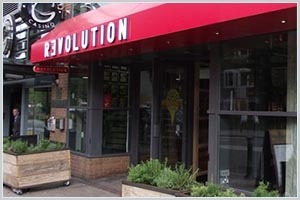 Pub quizzes take place at Revolution Bar, Broad St on Wednesdays (weekly) at 20:00. Entry is £1.00, you can have up to 7 people on a team. There are prizes of cash, drinks. Happy quizzing! Birmingham's Biggest Quiz Night comes to Revolution! Join us for interactive smartphone quizzing every single Wednesday. There's a £150 cash jackpot, a £100 bar tab, free cocktails and 36 shots to be won! What is the world's largest ocean?